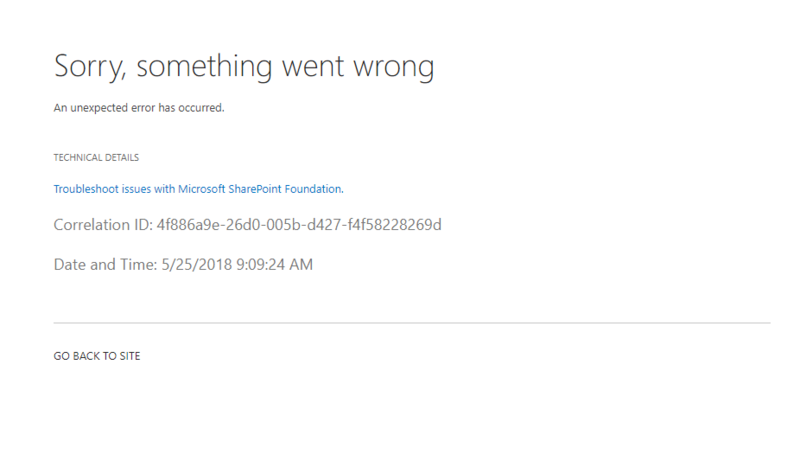 When I try to access a link from our portal company website (SharePoint), for example AttendancePlaces/AllItems.aspx, it asks for admin credentials as normal but after that I get an error "Sorry something went wrong". In the log files, it says that the "Application error when access /AttendancePlaces/AllItems.aspx, Error the list doesn't exist with the current url. Whether this issue happened in other lists/libraries/SharePoint pages? Check the existing lists/library or create new one. If this happened in all site, go to IIS manger, check if the web application started, and you can restart and check again. Switch to other users to access this link and check if the issue exists. Based on the Correlation ID to check the ULS log( C:\Program Files\Common Files\Microsoft Shared\Web Server Extensions\15\LOGS) to get more error message related with this issue. Not the answer you're looking for? Browse other questions tagged sharepoint-server error asp.net windows-server-2012-r2 or ask your own question. “Sorry Something went wrong” when I modify view in SharePoint 2013 Assets Library!